For Red Cells – Neonatal Features and Benefits *Data available upon request from Haemonetics Corporation.  Easy to use technology provides priming by gravity or rapid priming by squeezing the blood bag. 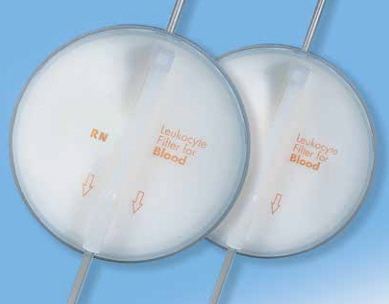  Proven to consistently and efficiently deliver low leucocyte residuals, affording the maximum patient protection against leucocyte related transfusion complications (consistently averaging less than 2 x 105 for aliquots of approximately 60 mL and/or less than 5 x 105 for aliquots from approximately 60 – 150 mL).  High technology filtration media and minimal filter hold-up volume (12 mL) provides minimal loss of red cells without the need for saline flushing.  Primes directly with red cells quickly and conveniently without the need for priming with saline.  Provided with a needleless adaptor to reduce the risk of needle stick injury.